Order TODAY for Your Little One's Health and Happiness! Congratulations! By choosing Beaming Baby Bio-Degradable Diapers, YOU have taken a big step towards giving YOUR BABY The HEALTHIEST Start to Life! By using Beaming Baby's Bio-Degradable Diapers, you have shown that you are in the TOP 5% of moms who will go the EXTRA MILE to protect your baby from the harsh chemicals in standard baby products. Not only will you be DRAMATICALLY reducing the number of chemicals which YOUR BABY comes into contact with on a daily basis, but also, you can rest assured that you are using the Most Environmentally Friendly Baby Essentials on the Planet! HOW WILL MY BABY BE HAPPIER With Beaming Baby Size 1 Diapers? YOUR HAPPINESS GUARANTEED with Beaming Baby Mini Diapers! OVER 77% BIO-DEGRADABLE, (including the packaging) that's 53% more bio-degradable than standard disposable diapers and 33% more bio-degradable than eco-disposable diapers; this is the Most Bio-Degradable Disposable Diaper in the USA. 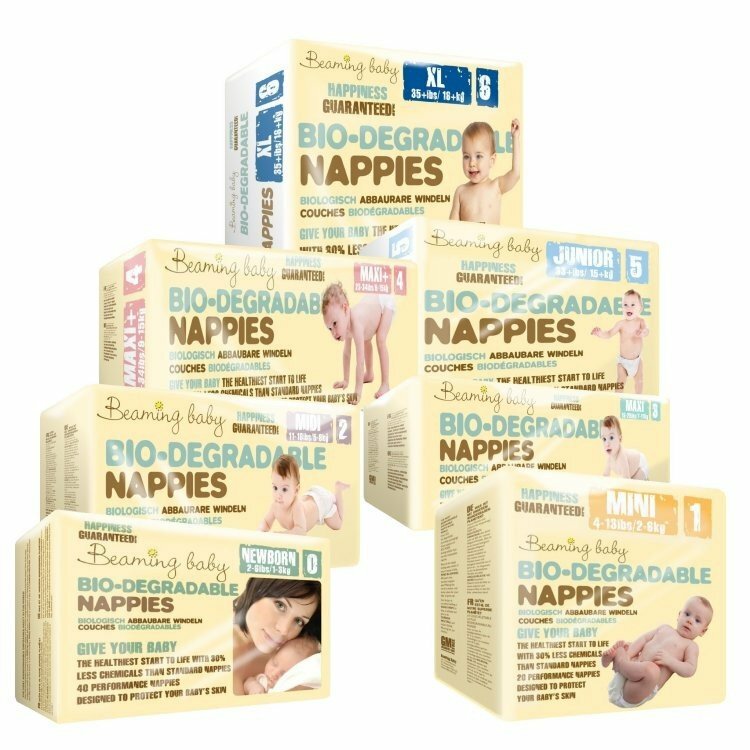 Beaming Baby Bio-Degradable Diapers Size 1 are Totally Chlorine Free and contain only Clean Plastics which are used in the Velcro patch and elasticated back and side panels. I love the product. My son has not experienced any diaper rash and I sleep well knowing I am doing something for the planet. The only reason I gave it 4 stars was because of the price. No leakages or rashes. Have tried other eco friendly diapers but none have performed as well as these. Great customer service, really friendly and fast delivery. The best customer service I've had anywhere! Not to mention a great product! Couldn't recommend more! My little girl has the happiest botty! Love the product, wouldn't use another! My baby girl has the happiest bottbott! Fast delivery, easy ordering. Fast delivery, easy ordering. Love this product so and my baby girl ! Incomparable to anything on the market!! I think you are very good company great service , will definitely return. Very good value, excellent product very good for the babies skin with no nappy/diaper rash . Great value for money. Would highly recommend. No rash at all. Beaming Baby Bio-Degradable Diapers Newborn Mini (Size 1) Case of 8 (160 diapers) Bulk Buy Savings!